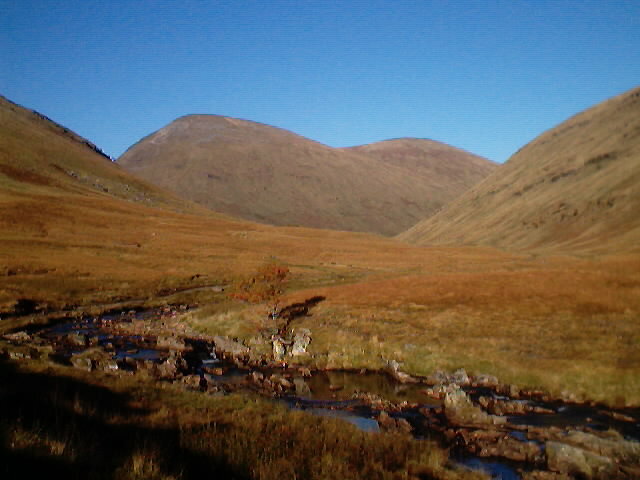 Not a particularly inspiring hill, as Munros go, Beinn Mhanach lies between the Orchy Hills and Loch Lyon to the north of Tyndrum and south of Bridge of Orchy. 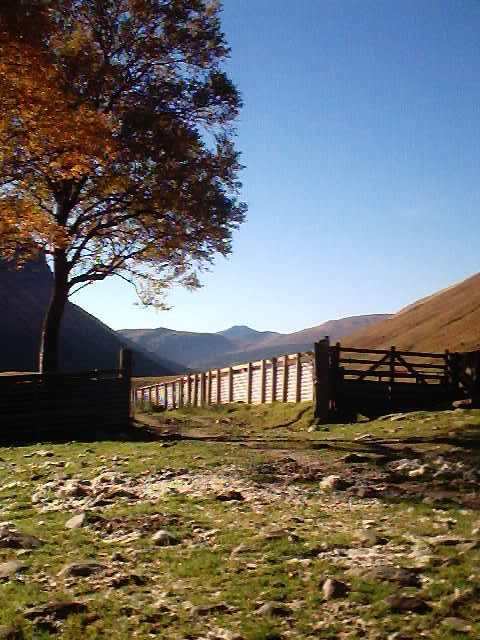 Tyndrum, situated by the junction of roads leading to Oban and Fort William, is a key service centre for tourism and the surrounding farming community. It is also the junction of railways leading to Oban and Fort William. Bridge of Orchy, where a bridge was built over the River Orchy in 1751 during the construction of a military road, lies six miles further north, at the head of Glen Orchy. Beinn Mhanach rises to a height of 3,127 feet/953m. Its name derives from the Gaelic for 'monks' hill'. The route involves around 25 river crossings with varying degrees of difficulty, 12 of which could give problems should the river be in full spate. It is possible to avoid a couple of the bigger ones by crossing the Allt Kinglass by the bridge at GR 327357 onto its north bank and go up to where the track crosses to the south bank near the plantation at GR: 341374. The track on the southern side, however, is the better one. For this route, follow the access road past the farm, turning right at the bridge (GR: 327357), and follow the south bank of the Allt Kinglass. Continue alongside the river, under the railway viaduct that carries the West Highland Line and over the biggest of all the fords up into Auch Gleann to the sheepfold at Ais-an t-Sidhean. Where the path splits at GR 358396, follow the right-hand route, east along the Allt a Chuirn, up to the watershed. Ahead is the most southerly tip of Loch Lyon. Cross the bridge alongside the ravine and man-made flume at Strath Tarabhan (GR: 368397) some four and a half miles (7.3km) into the walk. Leave the track beside a signpost - with a map and route pointer arrow that states 'You are here' - and head north to begin the steep 1,640 feet (500m) ascent to the col between Beinn a' Chuirn and Beinn Mhanach following the intermittent, sometimes wet and muddy path up the line of the boundary fence. Just before the col (2,920 feet/890m) at GR: 366412, head east across the fence to ascend the gentler slope to the summit cairn of Beinn Mhanach 3,127 feet/953m). Return by the inward route but, if leaving the top in cloud, be sure to take a compass bearing back to the col as the featureless summit can be very disorientating. Map OS Landranger sheet 50. Start/parking Park by the side of the A82 at the access road to Auch Farm, GR: NN 317354. Take care not to obstruct access to the farm or stray onto the busy carriageway. There is roadside parking for at least six cars if they are sensibly parked. Grading A long walk in followed by a demanding climb on steep, grassy slopes then a long walk back out! Recommended for fit hillwalkers. Allow 6 - 8 hours. Sheep and cattle grazing so dogs must be kept on a lead.